Mapusa Urban Cooperative Bank account holders can now withdraw from their accounts, but a limit of 25 per cent has been imposed on the account holders having balance of above Rs one lakh. An interim order was issued by Bombay high court at Goa today. 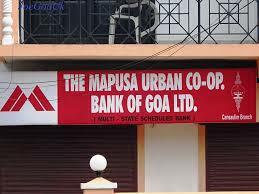 Panic had struck among the account holders of Mapusa Urban Cooperative Bank (MUCB) when the Reserve Bank of India, on 24 July, had suddenly issued a directive not to allow withdrawal of more than Rs 1000. The bank had had however succeeded in getting the RBI order stayed on 27 July. While the matter is still being heard, the division bench of Justices K L Wadane and F M Reis passed another interim order today, while refusing to continue the blanket stay granted earlier. The interim order passed today allows account holders, having a balance of above Rs one lakh, to withdraw maximum 25 per cent amount (Rs 25,000) from their account. However, the bank should not allow net withdrawals of more than Rs 25 crore, until further orders, stated the high court order. The high court has also taken note of the fact that salaried are directly credited the accounts of salaried people, thus the relief is granted. The court order is however silent about the account holders having a balance less than Rs one lakh. “We are interpreting it positively and allowing withdrawals without any restrictions for the account holders having balance less than Rs one lakh”, said Ramakant Khalap, former chairman of MUCB. The RBI also informed the high court that it will examine the liquidity position of the bank in ten working days.